Central nervous system leukemia may present in different ways. However, intraparenchymal mass is extremely rare in childhood leukemia. Herein, we report a boy who presented with right hemiparesis and anisocoria 1 year after the cessation of the chemotherapy protocol for acute lymphoblastic leukemia. Cranial imaging demonstrated an extensive mass located in the anterior white matter of left frontal lobe, and cerebrospinal fluid examination revealed concomitant lymphoblasts. Immunohistochemical staining of the biopsy material showed neoplastic cells with positive CD10 and TdT. Complete remission was achieved with chemotherapy alone for a duration of 2 years. 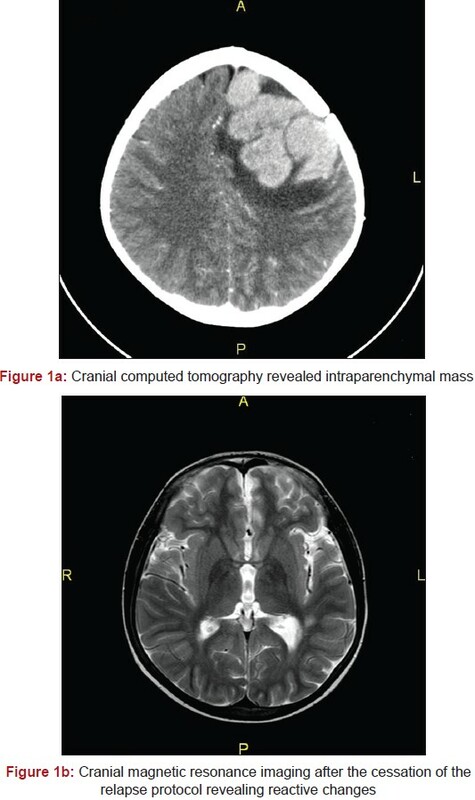 Herein, we report a leukemic child with isolated CNS relapse confirmed by both CSF evaluation and cranial imaging showing an extensive intracerebral mass to underline various types of CNS involvement of ALL. After the 22 weeks of the therapy, he experienced generalized tonic-clonic convulsion. However, CSF evaluation and cranial magnetic resonance imaging (MRI) showed no involvement. On the 55 th week; lymphoblasts were detected in CSF by cytocentrifugation during routine examination. Cranial MRI was normal again. He was retreated with St Jude TXIIIB induction protocol  and triple intrathecal (IT) (metotrexate-cytarabine and prednisolone) therapy was performed twice a week until the clearance of the CSF. Triple IT therapy was continued monthly and craniospinal radiotherapy was also added to the protocol. At the end of the treatment on 120 th week, he achieved complete remission without blasts in bone marrow and CSF. He was admitted to emergency room with right hemiparesis a year later. Physical examination showed significant decrease in muscle power on the right side of the body, anisocoria, and bilateral papilledema by fundoscopic evaluation. Computerized cranial tomography (CCT) yielded a mass in size up to 6 cm in the largest diameter located in deep white matter of left anterior frontal lobe. CSF evaluation showed TdT positive lymphoblasts with high protein level (82 mg/dL). Bone marrow aspiration showed no blast again. Complete surgical resection was performed, and he gained the function of right extremities dramatically the day after the operation. Immunohistochemical staining demonstrated diffuse positivity with CD10 and patchy positivity with TdT. Owing to the diagnosis of the second isolated CNS relapse, a new chemotherapy protocol was planned, but the family refused the therapy and left the hospital. He presented with decreased muscle power on the right side of the body and headache again 3 months after the operation. New cranial imaging showed the recurrence of the hyperdense lesion with the dimensions of 8 × 5 cm and midline shift [Figure 1]a. Triple IT therapy twice a week was performed till the CSF was cleared of blasts, and St Jude ALL relapse protocol was started. The mass begun to decrease in size and was completely shrunken a month later without surgical intervention. He completed ALL relapse protocol and is still in remission with no blast in CSF and bone marrow. The MRI at the end of the relapse protocol showed bilateral parietal subdural collections and gliotic-atrophic signal changes in left anterior frontal lobe [Figure 1]b. The presence of lymphoblasts in CSF at the diagnosis, traumatic diagnostic lumbar puncture, high initial leukocyte count, T-cell immunophenotype, and pre-B ALL with t (1;19) constitute the risk factors of CNS relapse. ,, Although our patient did not possess any of the aforementioned risk factors, he developed CNS relapse 3 times. Egan et al. reported that chemo/radiotherapy resistant residual blasts in CSF might be responsible for these relapses. It may be thought that the generalized tonic-clonic convulsion on the 22 nd week was thought as a clue for the first CNS relapse. However, no blasts were detected in CSF by cytology and cytocentrifugation. Between 22 nd and 55 th weeks of the therapy, triple IT therapy was performed at every 2 months and the convulsion did not repeat. This period between the convulsion and CNS relapse might be due to additive effects of both anti-epileptic drugs and IT therapy. CNS leukemia - at the diagnosis or relapse - may develop in various types; mostly, blasts can be detected in CSF without neural tissue involvement. Leptomeningeal and/or parenchymal infiltration may also develop. Leptomeningeal involvement may be either focal or diffuse. When it is focal, it may mimick parenchymal brain tumors due to local contrast uptake. The diagnosis may be difficult particularly if CSF evaluation showed no blast. Leukemic cells were defined to firstly infiltrate the walls of superficial arachnoidal veins and subsequently progress into deep arachnoid vessels located in white and gray matter. Obstruction of arachnoid villi impedes CSF circulation and consequently leads to increased intracranial pressure. At this stage of the progression, patients generally present with some symptoms such as headache, blurred vision, and other neurologic findings, suggesting CNS relapse and necessity of CSF evaluation. If the patients cannot be diagnosed at this stage, blood-brain barrier damage occurs leading to intracerebral leukemic infiltration. In present case, lymphoblasts were detected only in CSF without neural tissue involvement at the first CNS relapse, but parenchymal mass developed at the second and third relapses. Fortunately, the mass was totally excised due to perfect localization for surgery. Intracerebral mass is more common in patients with acute myeloid leukemia (AML) as granulocytic sarcoma and T-cell immunophenotype than those with B-cell ALL. This is partly due to the relatively more common expression of CD56 - an isoform of the neural adhesion molecule (NCAM) - in AML and T-cell ALL. Although CD56 staining was negative, parenchymal leukemic infiltration developed twice in our case. To our knowledge, this is the 2 nd leukemic child who developed intraparenchymal mass as a CNS leukemia until now. It should be noted that the present case per se did not have any of the identified risk factors, but he developed three CNS relapses, two of which as development of an intracerebral mass. The reason of these CNS relapses remains elusive and needs further investigations. 1. Pui CH, Howard SC. Current management and challenges of malignant disease in the CNS in pediatric leukaemia. Lancet Oncol 2008;9:257-68. 2. Pui CH, Pei D, Sandlund JT, Ribeiro RC, Rubnitz JE, Raimondi SC, et al. Long-term results of St Jude Total Therapy Studies 11, 12, 13A, 13B, and 14 for childhood acute lymphoblastic leukemia. Leukemia 2010;24:371-82. 3. Jeha S, Pei D, Raimondi SC, Onciu M, Campana D, Cheng C, et al. Increased risk for CNS relapse in pre-B cell leukemia with the t (1;19)/TCF3-PBX1. Leukemia 2009;23:1406-9. 4. Pui CH, Evans WE. Treatment of acute lymphoblastic leukemia. N Engl J Med 2006;354:166-78. 5. Winick NJ, Smith SD, Shuster J, Lauer S, Wharam MD, Land V, et al. Treatment of CNS relapse in children with acute lymphoblastic leukemia: A pediatric oncology group study. J Clin Oncol 1993;11:271-8. 6. Lowichik A, Bernini JC, Tonk V, Ansari MQ, Rollins NK, Winick NJ, et al. Relapse of precursor B-cell acute lymphoblastic leukemia as an isolated central nervous system mass lesion 9 years after initial diagnosis. Med Pediatr Oncol 1996;26:129-34. 7. Lee SH, Park J, Hwang SK. Isolated recurrence of intracerebral granulocytic sarcoma in acute lymphoblastic leukemia: A case report. J Neurooncol 2006;80:101-4. 8. Gürgey A, Yetgin S, Cetin M, Gümrük F, Tuncer AM, Tunçbilek E, et al. Acute lymphoblastic leukemia in infants. Turk J Pediatr 2004;46:115-9. 9. Bürger B, Zimmermann M, Mann G, Kühl J, Löning L, Riehm H, et al. Diagnostic cerebrospinal fluid examination in children with acute lymphoblastic leukemia: Significance of low leukocyte counts with blasts or traumatic lumbar puncture. J Clin Oncol 2003;21:184-8. 10. Marwaha RK, Kulkarni KP, Bansal D, Trehan A. Central nervous system involvement at presentation in childhood acute lymphoblastic leukemia: Management experience and lessons. Leuk Lymphoma 2010;51:261-8. 11. Egan K, Kusao I, Troelstrup D, Agsalda M, Shiramizu B. Mitochondrial DNA in residual leukemia cells in cerebrospinal fluid in children with acute lymphoblastic leukemia. J Clin Med Res 2010;2:225-9. 12. Price RA, Johnson WW. The central nervous system in childhood leukemia. I. The arachnoid. Cancer 1973;31:520-33. 13. Struhal W, Oberndorfer S, Lahrmann H, Lindeck-Pozza E, Hess B, Nussgruber V, et al. Myeloid sarcoma in the central nervous system: Case report and review of the literature. Acta Clin Croat 2008;47:19-24. 14. Kern WF, Spier CM, Hanneman EH, Miller TP, Matzner M, Grogan TM. Neural cell adhesion molecule-positive peripheral T-cell lymphoma: A rare variant with a propensity for unusual sites of involvement. Blood 1992;79:2432-7.